PETROZAVODSK, August 10. /TASS/. The 18th-century wooden Orthodox Church of the Dormition of the Theotokos, which burned to the ground in the city of Kondopoga located in Russia’s northwestern Karelia Region, could be restored, Svetlana Kuspak, Chief Specialist at the Regional Cultural Heritage Protection Department, told TASS. "The church can be restored, there can be no doubt about that. The scientific documentation has been fully preserved. How much it will cost and how long it will take is another story," she said. "The Dormition Church is a federal cultural heritage site, its level is comparable to UNESCO sites. It’s unique and well-known," Kuspak stressed. According to the Russian Emergencies Ministry’s regional directorate, the fire was reported at 09:33 Moscow time on August 10. The first firefighting crews arrived at the scene at 09:41 Moscow time. The ministry’s press service informed TASS that the church had been completely destroyed by fire. The fire could have been caused by tourists’ careless actions, the Petrozavodsk and Karelia diocese of the Russian Orthodox Church reported on its website. "The Dormition Church in the city of Kondopoga is a monument of federal significance built in 1774. It is also a wooden architecture monument and a branch of the Kondopoga City Museum. <…> One of the versions is that the fire was caused by tourists’ careless actions," the diocese said. It noted that the building was not the property of the Russian Orthodox Church, and there were no church services in it. The last priest, Father John Lyadinsky, was shot in 1937. 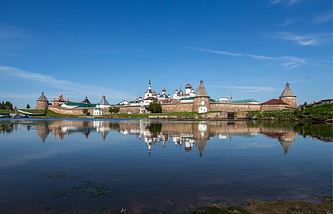 According to the republican Cultural Heritage Protection Center, the Dormition Church was one of the tallest wooden churches in northern Russia. It was 42 meters high, its length was 24 meters and width - 14.6 meters.